— Highway crashes claimed the lives of 37,133 people in 2017, accounting for 95 percent of the 38,958 who died in transportation related accidents that year, according to data provided by the National Highway Traffic Safety Administration and released Thursday by the National Transportation Safety Board. The data indicate 712 fewer people died in transportation accidents in 2017, compared to the 39,670 who died in 2016. Aviation, marine and highway deaths decreased while rail and pipeline fatalities increased. Rail experienced the largest increase with 58 more deaths in 2017 than the 703 fatalities in 2016. While 673 fewer people died in highway crashes in 2017 compared to 2016, highway fatalities continued to represent 95 percent of all transportation fatalities. Aviation deaths decreased from 412 in 2016 to 350 in 2017. While general aviation showed the largest decrease with 56 fewer deaths, general aviation again accounted for 94 percent of all aviation fatalities. Recreational boating accidents killed 43 fewer people in 2017 than in 2016, but 27 mariners died in commercial fishing in 2017, compared to 17 in 2016. Overall, there were 39 fewer deaths in marine transportation compared to the 733 fatalities in 2016. Highway fatalities decreased from 37,806 in 2016 to 37,133 in 2017, and crashes involving passenger cars, light trucks and vans, pedestrians, motorcycles, pedalcycles, and buses resulted in fewer deaths, but deaths associated with crashes involving medium and heavy trucks increased to 841 in 2017 compared to 725 in 2016. Four more people died in pipeline accidents in 2017 compared to the 16 who died in 2016. 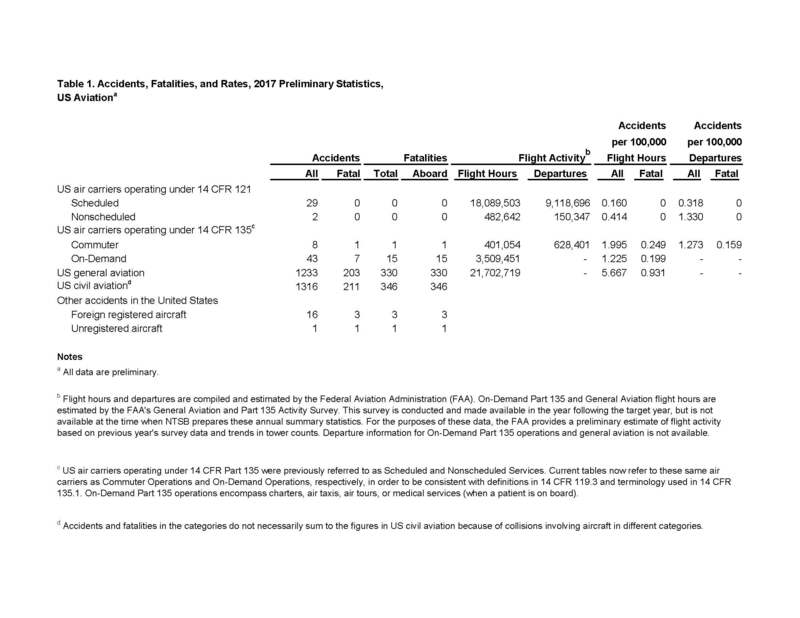 Preliminary aviation accident statistics also released Thursday show a slight decrease in the number of US civil aviation accidents, with 1,316 in 2017 compared to 1,335 in 2016. There were 10 fewer fatal general aviation accidents in 2017 than in 2016, and the fatal accident rate remained below one fatal accident per 100,000 flight hours for a second consecutive year. The approaching Thanksgiving holiday weekend is typically the busiest travel weekend of the year in the United States and marks the start of the holiday travel season. The NTSB reminds travelers that speed, distracted, impaired and drowsy driving are key factors in highway fatalities. When traveling by bus, train or plane, stay buckled up (just as if you were in your car), know where your nearest safety exit is and how to use it, and if directed to evacuate, leave your carry-ons behind!